Spirit Reverb is an audio plug-in featuring authentic spring reverb and powerful digital reverb effects. 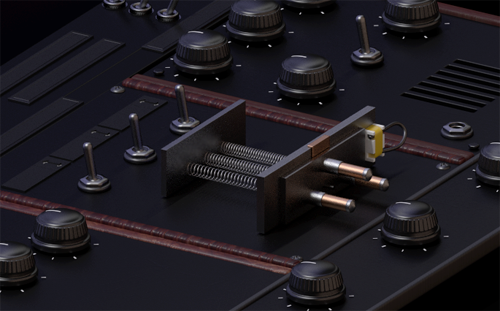 The 7 reverb types can be tuned to perfection with the customizable control panel. Spring reverbs can be adjusted for different numbers of springs and different spring parameters affecting length, tone, and texture. Tube preamp simulation gives an authentic vintage spring reverb tone as harmonics and nonlinearities were important factors in vintage spring reverb units. Spirit Reverb can also do totally original effects, such as the Cosmic reverb type, which is generally set like an echo effect and causes a swelling frequency sweep trail. All effects have a parametric EQ that can be used either after the effect, or on the wet signal only. Stereo spread effects provide an even more big and spacious reverb which can be dialed to the desired width in "Mono to Stereo" mode. Classic 2 spring reverbs are much sought after, and heard on some of the most famous recordings of all time. The springs in these units were tuned carefully, and the tube circuits in these units gave a treble heavy sound. The reverb was not as pristine as 3 spring units or later reverb effects, but the charm and energy of the sound more than made up for it. The EQ and preamp section of Spirit Reverb can duplicate vintage reverb tones and be fine tuned to get many effects geared for whatever instrument or style you are using. You also may be inspired by solid state spring reverb tones with a clear and bright sound, Spirit Reverb excels at this as well, with 3 springs enabled and a little scoop added to the EQ section, a full and clear spring sound can be achieved. This eliminates some of the chirp and echoing that a vintage reverb would exhibit. You can switch off the tube simulation at the top right of the controls. Sometimes the realistic spring reverb sound isn't enough, you can use Exaggerated and Exaggerated Low types to get a flashy chirping reverb. There are many effects that can be achieved with these tools. The Underground preset for example provides the watery dark sound that is sometimes associated with some spring effects. Totally original unrealistic reverb and delay effects can be achieved with spirit reverb as well. One built in preset for example is Fake Spring, sounding like a less springy spring reverb simulation, the opposite of the Exaggerated effects. It can be great for some situations and has a lot of versatility. The Digital mode uses some slightly different controls than the other modes and provides a highly adjustable reverb and delay combination. Finally Cosmic reverb is the effect that takes you to a realm of sweeping echoes and space textures, something you need to try in person to understand. You can buy Spirit Reverb direct from us, available as an instant download. Add to cart with the button below. Check out using the shopping cart at the top of the page. Use the payment options provided. Once purchased return to the site, make sure you are signed in. 2 boxes containing codes should be available, these may take a few minutes. Click the Unregistered button when using Spirit Reverb and enter the codes into the boxes. Click enter and the activation should be complete. By buying or using our software (the term software includes demos and test versions) you are agreeing to be bound by our software license, see license for details. Windows - 7 or later version of Windows.